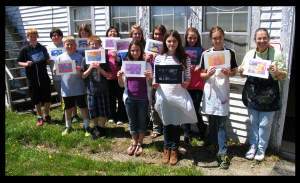 Midcoast Printmakers hosted Kathy Sparrow’s seventh and eight grade advanced art students at their studio May 15. The Palermo students learned how to make collagraphs and came to the studio to print them during the half day workshop. Some students also made monotypes as well using the press at the studio. Donations from Salt Bay Art Supply as well as the Palermo Parent Teacher Organization made the field trip possible and a success for all. Midcoast Printmakers, Inc. is a non-profit dedicated to education in all forms of printmaking. Visit our Classes page to see course listing.